On the south western end of the Sainte Anne Island and ten minutes by boat from the mainland of Mahe, Sainte Anne will awaken the essence and spirit of adventure within you. A mere 4 kilometres from the Seychelles International Airport, there’s little reason stopping you from experiencing the wonders of this island jewel. 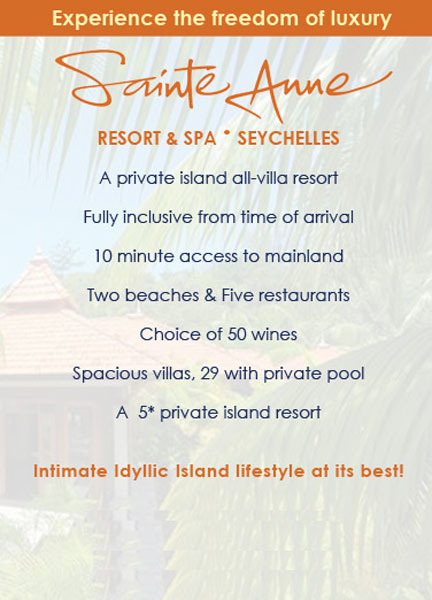 Renowned for its service and attention to detail, Sainte Anne draws guests into the culture of island living. A way of life where the scent of the ocean and the sounds of tropical birds play on your senses. Whichever of the 87 villas you’ve chosen to experience your stay in, you’ll be inundated with the sort of rest that your body and mind have been craving. From private gates to intimate gazebos you’ll always be a step away from the lucid greens of palm fronds and sparkling ocean waters. The king-size beds are draped in luxuriously lighted fabrics, allowing sunlight to stream in straight through your panoramic window views. The Royal Villas has the added luxury of a sparkling pool. The suites are set away from the main hotel for added privacy. Sans Souci is the hotel’s answer to your bar needs. Here quality cocktails and snacks are always on hand to accompany the wonders of the island sunset, all the way to midnight. L’Abondance is Sainte Anne’s main restaurant. Surrounded by water with the nearby pool and the ocean beyond it, L’Abondance will feed your senses over breakfast, lunch and dinner with a variety of fine foods. L’Oceane restaurant serves fresh meals in al-fresco dining, where the ocean water laps at your feet. Le Mont Fleuri is the place to be if you’re seeking freshness straight from the ocean. Here the seafood is only surpassed by the ambience of tranquil romance. Le Robinson is kept guard by a hefty granite outcropping. Experience a new dining experience with hot stone grills or lobster evenings, each event guaranteed to create lasting memories. People come for the luxury and end up romanced by nature at Sainte Anne. This island wonderland has a unique and compellingly green environment that will capture your senses, even if the spa doesn’t. From granite rock faces to the rare species of plant life endemic to the island, hiking, snorkelling and many other activities will take you into the heart of this special place and show you its secrets. As the night draws the stars in closer, take in the local entertainment of live music from a band or the tinkling keys of the resident piano. Regardless of what you do, the Seychelles has a way of washing into the linings of your soul. As far as your imagination can stretch is the real limit to the activities available to you. From the ocean come the wonders of snorkelling, kayaking, windsurfing, small-line fishing and trips on the waters in a glass-bottomed boat. All of these marvels will thrill you with the variety of ocean breezes and tropical fish awash in the waters. 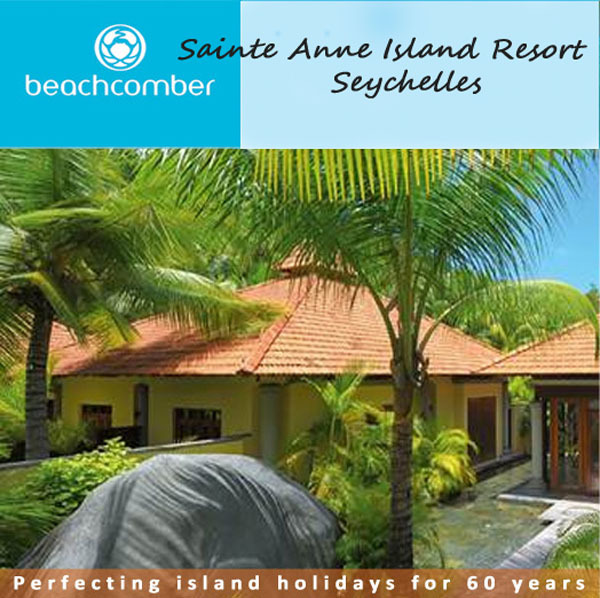 You’ll find world class coaching in golf and tennis at every Beachcomber resort. The coaches and trainers are handpicked to have all the qualities of communication, patience and observation to take your game to the next level. Mountain-biking takes you inland, to peruse the tropical terrain up close. Sandcastle building and beach picnics keep your feet on the sandy shores of the Indian Ocean. Many more opportunities await you to explore the island, but if you’d prefer to pamper yourself and rejuvenate your body, the renowned House of Clarins spas are waiting. If fitness is your value then indulge in a workout at one of the well-stocked gyms. Whichever direction your wishes take you, know that there’s always something to experience with Beachcomber Resort’s array of activities.